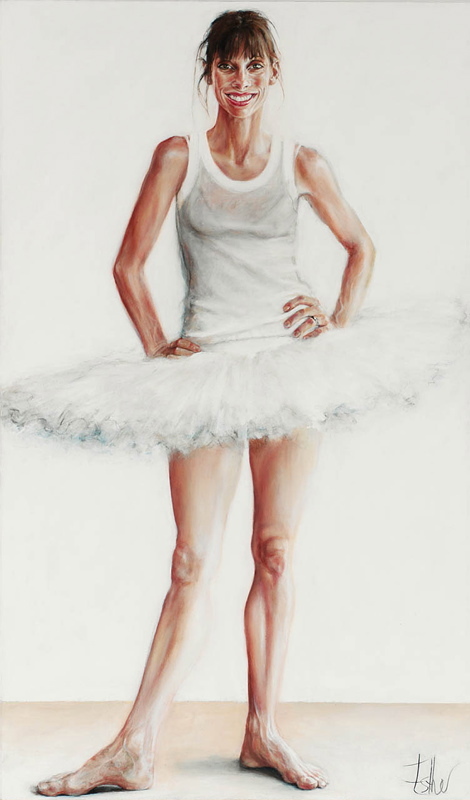 Lynette (Lindy) Wills is a principal artist at the Australian Ballet with whom she has danced since 1991. Esther Erlich saw a photograph of Wills presenting an award and was struck by it. “I wasn’t quite sure how to paint her,” says Erlich. “At first I had her in a skirt in a stance with one foot sticking out and I loved the way her leg curved.” Once they had got to know each other better, Wills agreed to don a tutu. “She looked so un-balletic, standing there in that pose, almost as if she was wearing shorts and a Bonds T-shirt,” says Erlich. Born in Melbourne, Erlich won the Archibald People’s Choice Award in 2000 for her portrait of Bill Leak and was an Archibald finalist again in 2002. She won the Doug Moran National Portrait Prize in 1998 with a portrait of marathon runner Steve Moneghetti and was a finalist in the same Prize in 1990. She has also been a finalist in the Portia Geach Memorial Award on eight occasions. She was represented in the national tour of Portraits 2001 – an Australian odyssey and had “Painting of the Month” at the Victorian Arts Centre in December.